Conservation biologist Carl Safina talks about his acclaimed new book, Beyond Words: What Animals Think And Feel. It’s an eloquent plea based on science and ethics for a major re-set on how humans regard our fellow animals. It’s a game changer. On the cover of Carl Safina’s new book, Beyond Words, is the photo of a baby elephant being gently lifted to its feet by a circle of solicitous elders. The image captures better than any words the caring and cooperation that characterizes these magnificent and endangered animals. The notion that only we humans evolved to have emotions and thoughts is bizarre. The other animals have arms, mouths and noses much as we do, so why wouldn’t they have feelings and thoughts, as well? Yet that common sense view is scorned by much of the scientific establishment. The prevailing view is that animals are instinctual automatons — maybe because that way, it is easier for us to justify our cruelty toward them. 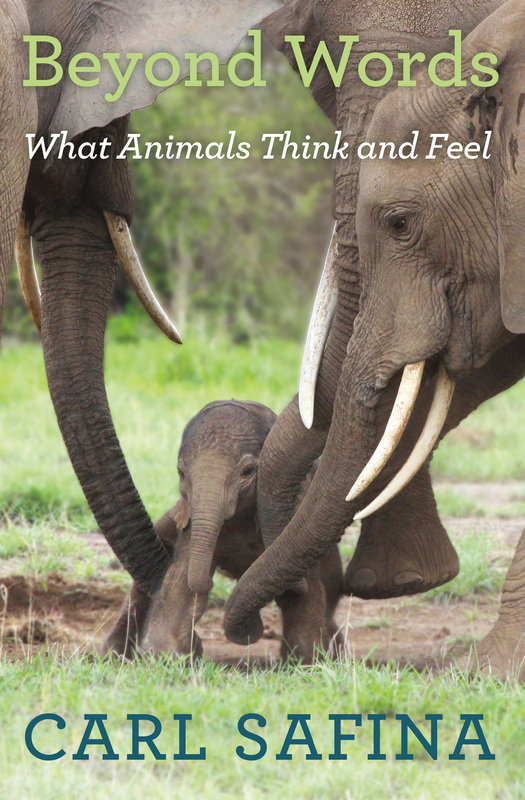 In Beyond Words, Carl Safina challenges this scientific convention by showing us humans the richness of the mental and emotional lives of the other animals: how they care and cooperate, how they strategize for advantage; how they communicate and create tools for their use. In his quest to understand who animals are, Safina followed elephant families in the African bush, wolf packs in Yellowstone, and killer whales in Alaska — among them the elephant matriarch Teresia and the wolf leader 21. And he doesn’t leave out the less charismatic animals, either. At a time when so many of them are disappearing because of us, Carl Safina’s new book is a passionate plea for our understanding of those we share this Earth with before it’s too late. Carl Safina’s work has been recognized with MacArthur, Pew, and Guggenheim Fellowships, and his writing has won Orion and National Academies literary awards, among others. He co-chairs the steering committee of the Alan Alda Center for Communicating Science and is founding president of the not-for-profit organization, The Safina Center.